SAP Press is your premier online source for SAP (Systems, Applications and Products) related books and technical guides at discount prices. Choose from over 250 SAP books from categories such as finance, HR, SCM/Manufacturing, CRM, BI/BW, BusinessObjects, administration, developer and more. Get a free SAP Solution Manager for SAP S/4HANA ebook. Summer Sale! Get 20% off all Books or 30% Off All Orders Over $250. Excludes Subscriptions and E-Bites. Limit one discount per order. 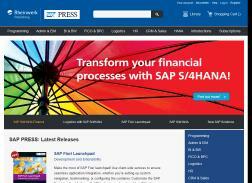 Get 15% off Product Cost Controlling with SAP Book. Save 10% on all books in Finance and Controlling category. Get 15% off Warehouse Management with SAP EWM book. Cyber Monday Sale! Get 30% off all books. Limit One Discount Per Order. $5 off per book deal, Use this discount code at checkout to get your savings! Get 10% off all books in category, ends today. Get 20% Off All Books. Get 15% off all SAP PRESS books. Get an Extra 10% off Your Next Purchase.